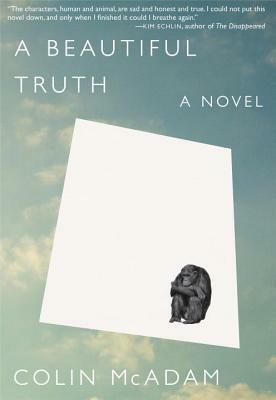 Told simultaneously from the perspective of humans and chimpanzees, set in a Vermont home and a Florida primate research facility, A Beautiful Truth at times brutal, at others deeply moving is about the simple truths that transcend species, the meaning of family, the lure of belonging, and the capacity for survival. A portion of this book's proceeds benefits Save the Chimps, the world's largest chimpanzee sanctuary. Looee, a chimp raised by a well-meaning and compassionate human couple who cannot conceive a baby of their own, is forever set apart. He's not human, but with his peculiar upbringing he is no longer like other chimps. One tragic night Looee's two natures collide and their unique family is forever changed. Colin McAdam'snovel Some Great Thing won the Amazon/Books in Canada First Novel Award and was nominated for the Governor General s Literary Award, the Rogers Writers Trust Fiction Prize, the Commonwealth Writers Prize, and for the John LlewellynRhys Prize in the UK. His second novel, Fall, was shortlisted for the Scotiabank Giller Prize andawarded the Paragraphe Hugh MacLennan Prize. Hehas written forHarper's andlives in Toronto." "The transformative difference in A Beautiful Truth is that its chimps aren't metaphors or tools for parody but faithfully described individuals... both disarmingly familiar and richly, movingly strange." "McAdam teases and turns around language, giving us a creative and wondrous portrait of nonhuman society from the inside out." "If A Beautiful Truth lingers long after it is read — and I promise you, it will — it’s because even as Looee becomes a son for Walt and Judy, he becomes for the rest of us a heartbreaking guide to how we treat our closest living relatives." "A moving, deeply researched novel." "A Beautiful Truth manages to parlay long established and widely disseminated scientific and anthropological facts into gripping and thought-provoking fiction... [McAdam] clearly conducted much research for this book." "Splendid... McAdam explores the unhappy history of humans adopting chimpanzees as playthings, curios and family members. Yet in a year when the National Institutes of Health has begun to formally retire its roster of medical-research chimps, McAdam's novel also sounds an elegy for the chimpanzees who spent their lives in laboratories... At its heart, “A Beautiful Truth” is about voice - who's talking, who's listening, what's understood and what's not. McAdam makes his novel special by getting inside many heads, especially the chimps’." "A Beautiful Truth does an amazing job at telling the stories of chimpanzees in captivity today and it also helps people understand why these amazing souls should be loved, respected and protected in their natural habitat. We hope everyone reads this book and comes to see Chimpanzees as we do." "One might expect the chimp point of view to be distracting, but it speaks to McAdam's talents that they become the most compelling parts of A Beautiful Truth... It's a dark lesson in family, parenting, and community — the way we impose our ideals on others seems to be the beautiful and horrible truth of human nature." "A beautiful novel about consciousness and communication, about how we connect with others and our surroundings, and what it means to truly exist in the world." "Colin McAdam's book may be a novel, but it's still based on intense research. On a surface level, it tells the stories you've heard about before—the childless couple who decides to adopt a baby chimpanzee, the devoted scientist who communicates with chimps in labs, the process of studying pharmaceuticals on primates. But what makes A Beautiful Truth unique is its sincerity, its honesty, and its heart." "[A BEAUTIFUL TRUTH] is grounded in solid research on chimp behavior that, along with McAdam’s distinctive poetic prose, informs readers while enriching a deeply moving story." "McAdam's language reaches into that mysterious place where a word ends and a feeling begins. A Beautiful Truth is a story about love and beauty and our dreams for our children and our inescapable loneliness. The characters, human and animal, are sad and honest and true. I could not put this novel down, and only when I finished it could I breathe again." "A work of exquisite sensitivity and prowess, McAdams' tale is of two species astride not a divide but a continuum, of our longings and resiliencies and the fate we share: being stronger than we are evolved." "Haunting. Heartbreaking.... it is a tale of empathy and honesty, deftly told and beautifully rendered." The portrayal of chimpanzees as individuals with memories isn’t just a fictional device; the commonality of human and chimpanzee conceived here is achieved not by eliminating the traits that divide them but by illuminating the differences that unite them.... With concise language, this heartbreaking tale of loneliness and remembrance reminds us that understanding is a process of growth and experience." "McAdam writes from the perspective of both humans and apes to both dizzying and daring effect... An earnest and oftentimes beautiful book with something to say about the world we live in and how we live in it." "A BEAUTIFUL TRUTH is extraordinary, rather beautiful, and experimental." "Absolutely compelling. A brave, shocking and memorably tender story." "McAdam’s haunting prose gives zingers of crisp images, but also leaves reverberations of desire. He successfully immerses us into the experience of the non-human primates through his careful but creative use of language. It is in its critique of scientific practices that the novel becomes less vivid and more prescriptive, but McAdam successfully negotiates the divide between objective distance and subjective participation that reveals yet again that it takes good fiction to disclose life’s most profound truths." "From joyous to cautious, from hopeful to purely devastating, A Beautiful Truth touches on so many different aspects of human emotion, it’s easy to forget that the perspective is often that of a chimpanzee." "Colin McAdam has a way of making simple words matter." "The crux of the story has to do with loneliness and empathy; people (and nonpeople) are to be marveled at for their ability and willingness to offer fellow creatures the balms of love, compassion and friendship, and McAdam doesn't flinch from the workings of cruelty and brutality, either. There's daring, and some pleasure, in the switches of point of view and especially in McAdam's effort to come up with a subtle, sensitive way to inhabit the chimpanzees and approximate their version of English idiom." "[A] gut punch of a novel … that’s going to get a lot of people talking. And crying." "One of the most important important novels I've read in some time." "A profound and thought provoking novel that informs while unfolding its engaging story." "McAdam does a surprisingly thorough job of dispelling the idea that Looee and the other primates in the novel are just lumbering, dumb animals... Heart-wrenching. " "A Beautiful Truth is an unsettling fictional meditation on evolution, altruism and empathy, revealing just how little separates humankind from animals."